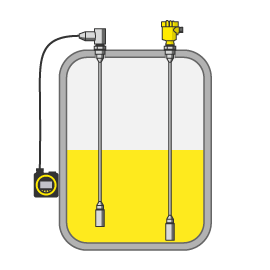 In hydrostatic level measurement, the measuring cell of the pressure transmitter detects even the slightest changes in hydrostatic pressure, which increases or decreases depending on the filling level. The acting pressure is converted into an electrical signal by the integrated electronics and then outputted as an output signal. Different types of measuring cells are used in level measurement based on the hydrostatic principle.